Set of Harry Potter Limited Edition Cover Prints. Harry Potter and the Half Blood Prince Deluxe Edition. Signed by illustrator Mary Grandpre 1st Edition 1st Print. Golden Snitch and book end NOT INCLUDED. Signed book condition: Fine in Near Fine Dust Jacket. Dust jacket has one small pinhole on the spine. Cover Prints condition: Vary Good a little wrinkling in spots(pictures 5-11), has some color on the back of 2 (picture12). Use the magnification option to see better A priceless Collection and a great gift that will make everlasting memories. This collection is for ages who love to celebrate the enduring magic of Harry Potter. The prints are all 11 inches tall by 25 inches wide includes the followings cover prints. Harry Potter and the Sorcerer's Stone - Harry Potter and the Chamber of Secrets - Harry Potter and the Prisoner of Azkaban - Harry Potter and the Goblet of Fire - Harry Potter and the Order of the Phoenix - Harry Potter and the Half-Blood Prince - Harry Potter and the Deathly Hallow. This Is A Great Set that any Harry Potter Fan Would LOVE! 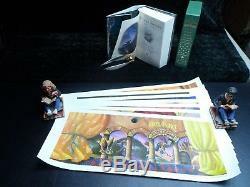 CHECK OUT MY OTHER HARRY POTTER ITEMS PROMO ITEMS SIGNED BOOKS 1ST EDITIONS AND MORE. Please feel free to ask any questions. I can provide more pictures if needed. The item "Harry Potter Signed Book HBP & Limited Edition Book Cover Art Set Mary GrandPre" is in sale since Saturday, November 25, 2017. This item is in the category "Books\Antiquarian & Collectible". The seller is "potter-more" and is located in Cheney, Washington. This item can be shipped to United States, Canada, United Kingdom, Denmark, Romania, Slovakia, Bulgaria, Czech republic, Finland, Hungary, Latvia, Lithuania, Malta, Estonia, Australia, Greece, Portugal, Cyprus, Slovenia, Japan, Sweden, South Korea, Indonesia, Taiwan, South africa, Belgium, France, Hong Kong, Ireland, Netherlands, Poland, Spain, Italy, Germany, Austria, Israel, Mexico, New Zealand, Philippines, Singapore, Norway, Saudi arabia, Ukraine, United arab emirates, Qatar, Kuwait, Bahrain, Croatia, Malaysia, Brazil, Chile, Colombia, Costa rica, Panama, Trinidad and tobago, Guatemala, Honduras, Jamaica, Antigua and barbuda, Aruba, Belize, Dominica, Grenada, Saint kitts and nevis, Saint lucia, Montserrat, Turks and caicos islands, Barbados, Bangladesh, Bermuda, Brunei darussalam, Bolivia, Ecuador, Egypt, French guiana, Guernsey, Gibraltar, Guadeloupe, Iceland, Jersey, Jordan, Cambodia, Cayman islands, Liechtenstein, Sri lanka, Luxembourg, Monaco, Macao, Martinique, Maldives, Nicaragua, Oman, Peru, Pakistan, Paraguay, Reunion.